That doesn’t mean people won’t try whether we are talking about socialist Venezuela or Justin Trudeau’s Canada. We got more proof that it isn’t working yesterday when the government released their Annual Financial Report. The plan to tax the rich isn’t working. In fact, income tax revenues were down. Didn’t hear much about that? Didn’t hear about that at all? Hardly surprising given the reporting lately. Which is tragic, because if you just caught the headlines, read, listened to or watched most newscasts, you missed the big story. I mean you got the story the Trudeau government wanted you to hear, the deficit is smaller than predicted. The red ink for the fiscal year that ended in March only amounted to $17.8 billion rather than the $23 billion the Liberals predicted in the budget. But the bit about tax revenues being down, that is true. They are down by $1.2 billion and the finance department says that is a result of the tax hike on top earners that Trudeau promised would bring in billions in new revenue to pay for his cut to the middle rate. Overall federal government revenues were down by $2 billion while spending was up $16.2 billion. And somehow we are being told to celebrate the deficit being smaller than projected. Here’s a little nugget for you, put in the report for those that bothered to read it, the deficit would have been $21.5 billion had the government been able to spend all the money they planned to spend. But even these guys couldn’t shove the money out the door fast enough including spending on infrastructure. “Program expenses were $3.7 billion lower than expected, reflecting a number of factors, including lower-than expected infrastructure transfer payments,” reads the report. All of this puts Justin Trudeau’s class warfare plan to squeeze small businesses through tax changes into perspective. Trudeau came to power promising to stick it to the 1%, he ran on a platform inspired by the Occupy Wall Street movement of a few years back. 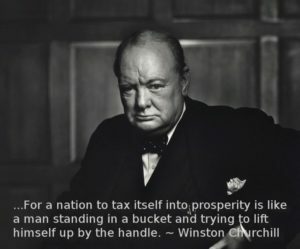 With his hike in the top tax rate from 29% to 33% not working, Trudeau needs to do something to generate more cash to feed the incredible increase in government spending. In fiscal year 2014-15, the last full year that the Conservatives were in power total program expenses for the federal government stood at $280.4 billion. In 2015-16, with Trudeau in power for just shy of half the year program expenses jumped to $296.4 billion. This latest report puts total program expenses at $311.3 billion, a staggering rise of $30.9 billion in additional spending in just two years. The Liberals have no plans to curtail spending, no plans to balance the budget, so when their latest plans fail – taxing Canada into prosperity by squeezing small businesses fail – we can expect more tax hikes to try and fix the government’s spending problem. Someone needs to tell Justin Trudeau that he’s standing in a bucket. “More taxes won’t solve Trudeau’s spending problem” … but it may fix Canadians’ Trudeau-problem! Than you Brian for your amazing news cover and reporting. You truly have a gift for the gab along with a good common sense head on your shoulders. I know many people have posted missing your videos on The Rebel. Take care and have a good day! A big fan from Alberta. Thanks for the support! Make sure you check back here and on Facebook but also listen to my radio show at cfra.com or on the iHeart Radio app. I am on from 7-10 pm ET Monday to Friday. That would be 5-8 pm MT. Justin should take a lesson from Ontario and sell assets. They could start with the CBC.